Chicago, IL — According to the most recent study from the American Society for Aesthetic Plastic Surgery (ASAPS), more than 9 million cosmetic procedures were performed. Liposuction was the most common procedure performed, having increased nearly 13% from the previous year, followed by breast augmentation, abdominoplasty, blepharoplasty, and breast lift. At his Chicago plastic surgery practice, board certified plastic surgeon Dr. Brian Braithwaite says both liposuction and breast augmentation have been the most popular procedures since the beginning of 2012. 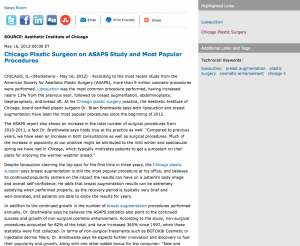 Despite liposuction claiming the top spot for the first time in three years, the Chicago plastic surgeon says breast augmentation is still the most popular procedure at his office, and believes its continued popularity centers on the impact the results can have on a patient’s body image and overall self-confidence. He adds that breast augmentation results can be extremely satisfying when performed properly, as the recovery period is typically very brief and well-tolerated, and patients are able to enjoy the results for years. Dr. Brian Braithwaite earned his medical degree from the University of Illinois College of Medicine. He completed a general surgery residency at the Keesler Medical Center, and a plastic surgery residency at the University of Louisville. After completing his training, Dr. Braithwaite became a staff plastic surgeon at Bethesda Naval Medical Center, and eventually became the Chief of Plastic Surgery at Bethesda. He is certified by the American Board of Plastic Surgery, and is a Fellow of the American College of Surgeons. The Aesthetic Institute of Chicago is located at 601 West Randolph St., Chicago, IL 60661, and can be contacted at (312) 361-8108. Dr. Braithwaite and his team can also be found online at www.drbraithwaite.com and their Chicago Plastic Surgery Facebook page.